Born in 1975 in Russia, Natalia Koreshkova began drawing and painting from a very early age. After completing classical art studies, giving form and direction to her artistic energy, she developed her unique imaginative style. Natalia took her passion into the world of fashion design and she continued to express a vivid creativity through drawings and paintings, using surrealistic interpretations with fantastical figures, both human and animal. She was later Commissioned to create artworks for private homes and corporate venues. Natalia has always traveled extensively and she has been artistically influenced by many places and cultures. Her style has continued to evolve, moving from illustrative towards abstract and surrealistic, bringing to life her own vibrant world of deep dimensional textures and vividly saturated colors. 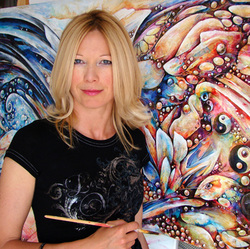 She collaborates with interior designers as well as other artists and her work has been presented internationally in a wide variety of settings.